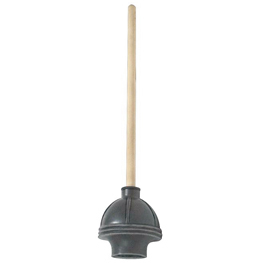 The Plumber"s Professional Plunger is a heavy duty remedy for stopped toilets, sinks or drains. Tail piece bends to application and compresses at all angles. Large 6" rubber b ell blows through clogs. 21" wood Handle. Each order is for 2 plungers.